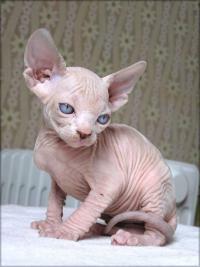 The Peterbald is a cat breed which originated in Russia. They are somewhat similar in appearance to Oriental Shorthair cats. Peterbalds are usually sweet-tempered, curious, peaceful, smart and energetic. They typically live in harmony with other cats and pets, and also with children.They love their family members and need to communicate with them; they are not a loner type of cat. They are not vindictive, and these characteristics make Peterbalds an excellent companion. 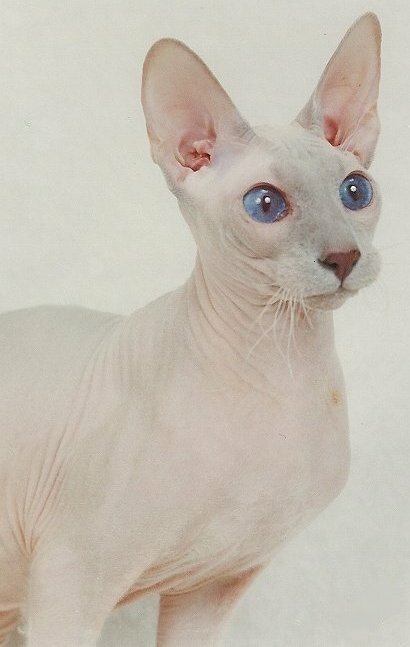 In 1996, the breed was adopted into the Russian Selectional Feline Federation (SFF) and given a standard and an abbreviation (PBD). In 1997 it was adopted into The International Cat Association (TICA) with the abbreviation PB, and in 2003 into the World Cat Federation (WCF) with the abbreviation PBD. Other used handles of the breed are PBD, PTB, PD and PSX. 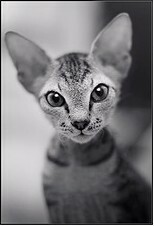 These days the breed develops in the direction of modern Oriental and Siamese types, that is to say a long muzzle, large set-apart ears, flat cheekbones, and an elegant body on long legs. 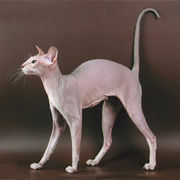 Therefore, all standards for this breed encourage mating with Oriental and Siamese cats and semi-longhair variations of those (such as Balinese and Javanese).